Attention Conservation Notice: This is a not-quite-as-tongue-in-cheek version of Professor Garnaut’s speech as my previous effort “Garnaut sparks riot“. Garnaut’s speech was presumably audio-recorded and will be available on the Environment Institute’s website… [Square brackets] is me editorialising. A capacity crowd (affluent, white, for the most part) of 850 people heard Professor Ross Garnaut give his first public lecture since delivering his final report to Prime Minister Julia Gillard on Tuesday 31st May. After an acknowledgement of country and request to switch off mobiles, Mike O’Brien, state minister for Energy, Agriculture and Fisheries was welcomed to the stage. He also did an acknowledgement of country [in stark contrast to Victorian practice, even before their Premier Ted Ballieu made it optional]. He thanked Ross Garnaut, applauding his central role in the climate change debate. As you’d expect, he then extolled the State Government’s record, pointing to it being the first state to appoint a climate change minister, one of the first places in the world to have dedicated legislation on the topic, and a 60% carbon dioxide reduction target by 2050. He pointed to renewables (wind, solar, geothermal), and also about the 30 year plan for Adelaide and the draft adaptation framework, now closed for consultation. After a few more buzzwords – modernity, rapid transit, electrification of heavy rail, expansion of light rail, Transport Oriented Development – he gracefully made way for the Prof Garnaut. Prof Garnaut himself seemed much more fluent and assured compared to his March 29 showing in Melbourne [perhaps the weight is now off his shoulders? Perhaps I’ve done my homework since then and am more familiar with the material?]. He said he saw lots of potential in South Australia, and stroked egos by saying that it was meetings like the one at the Adelaide Town Hall in 2008 that convinced him the Australian public were interested enough in the issue to make a difference. He said that if you listened to the well-honed statements of people determined to slow down or stop action being taken it would be easy to get pretty depressed, but that the community interest in the issue was the “saving grace.” This notion of an “independent centre” [hopefully not similar to Richard Nixon’s Silent Majority!] was a theme he returned to again and again. Community Interest, he said, is why the issue is still on the agenda a year after the political elite took it off the table a year ago. He said he was “fairly optimistic” of a good outcome for the current proposal of a tax-morphing-into-an-emissions trading scheme, even though it was a “complex parliament” [a possible understatement there!!]. If it didn’t succeed, the issue wouldn’t disappear, but simply come back on the agenda. He re-iterated what he had said the previous day at the National Press Club about the conflict between the national interest and special interests in policy making, a conflict that was always present, with either national or special interests predominating at different times. He repeated his analysis that the government was attempting some long-term reform and that parts of Big Business were adopting the role of spoiler (in his public statements he has rebuked the Business Council of Australia and BHP Billiton in particular). He noted that there were concerns in South Australia about jobs in Whyalla and Port Pirie. He then turned to his latest reports, which assess events since 2008 with the aim of telling the Government and the Multi-Party Climate Change Committee if there’s any strengthening/weakening/changing of his initial advice given. He noted that Australia will be affected directly because agriculture – sensitive to changes in temperature and aridity – is still an important part of the economy, and that Australia would be affected indirectly because many of its developing world trading partners were even more on the front line than us. Of all developed world countries, Garnaut said, Australia is most exposed to climate change. It was therefore, “not clever to be a laggard.” It was important to do its “fair share” which is more than we are doing at present. The 5% reduction on 2000 levels by 2020, a non-binding commitment made at Cancun in December 2010 was cited. Under current policies our emissions will actually have increased by 24%. He said that no other developed world country had a bigger gap or such a modest emissions reduction commitment. There was, he stated drily, no need to worry that Australia was getting ahead of other countries, rather the truth was we are a long way behind the average of other countries. He then pointed to the Scandinavian countries, which have had carbon pricing since 1991, and explicitly compared Australia to another country with huge fossil fuel endowment – Norway. He pointed out that the UK is aiming at a 50% reduction by 2025 on 1990 levels [but not the embedded carbon, a la Dieter Helm…] and that the UK with 60 million people has 1.7% of the world’s emissions, while Australia has 1.5% of world emissions with only 20 million people. Prof Garnaut warmed to his theme of knocking down the arguments for inaction by pointing out that China is taking big steps to reduce its emissions intensity, and is the world’s biggest investor in nuclear, solar, wind, hydro and biomass programmes. That the US is trying to take action (via regulatory measures rather than legislation) and is supporting its Clean Tech industry. On the question of “free-riding,” waiting for others to take action, he cited the Independent MP Tony Windsor “if the rest of the world were doing nothing, we should just join the lemmings in one last happy leap off the cliff” but that – as both he and Windsor knew well – that’s not true, and the rest of the world is bending its emissions growth downwards [so, the rate of acceleration towards the cliff is slower. Great, I feel safer already!]. Attacking the notion that Australia is irrelevant/inconsequential (a ‘pissant’ country, as he said elsewhere) Garnaut said that if we show consistency, we are consequential. On the question of being a “leader” on carbon reduction, Garnaut said that this wasn’t possible (see Chapter 3 of his report) and that the aim should be to get emissions intensity to ‘somewhere in the middle of the pack’ but that even this [modest] goal was a “bigger effort than we’re contemplating.” The first thing would be a 5% target, but that even this is not our fair share, and so ambition would need to be raised over time. The big question was how to go about it. And this is where Garnaut took careful aim at Tony Abbott, without mentioning him by name. “Direct Action” would be a very expensive way of going about things. Under it electricity prices would climb sharply, but there would be no revenue to the government to compensate the poor or to provide Emissions-Intensive Trade Exposed industry with support/temporary shielding, and no money for innovation. A fixed carbon price (a “tax”) for 3 years, at a price of $20 to “30 dollars, with a a sale of permits in the range of £11.5 billion dollars, rising over the decade would, could be offset with tax cuts. Obviously, he said, this would require “Good Governance” [another understatement!] 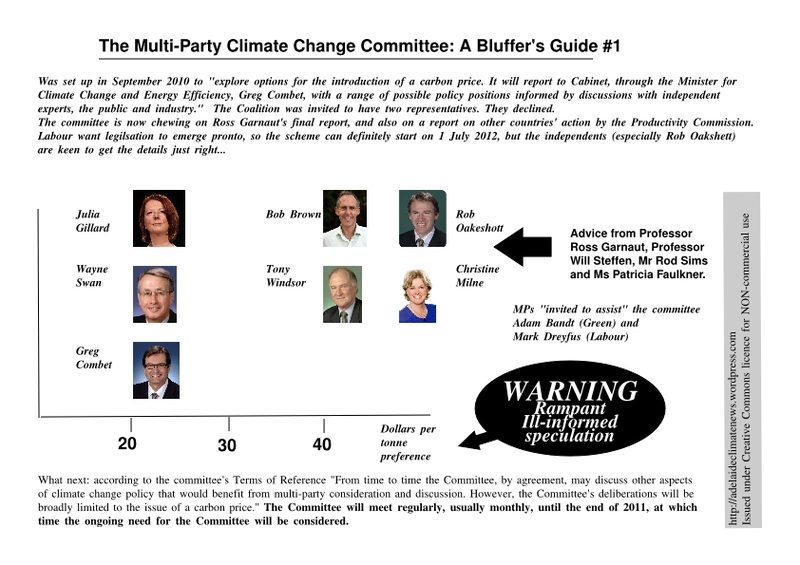 and Garnaut also talked about his proposed Independent Climate Committee to set/protect targets and oversee the transition to a full trading regime. Garnaut closed by saying that this was the fourth time we’ve moved towards economy-wide action, that each retreat has left behind regulatory mechanisms that have had little/no effect on carbon dioxide levels, but have had an impact on our standard of living. Failure on this occasion doesn’t mean the problem will go away. Garnaut said “not true, it’s better than that” assuring the questioner that for various reasons electricity suppliers will quickly be looking to reduce coal and gas usage and increase renewables. The second was from a Solar Industry chap who had taken umbrage at Garnaut dissing regulation as expensive, and asking Garnaut to talk about regulatory capture. The next question was on Peak Oil/Peak Gas – had the report taken these into account. Garnaut said yes, and that unfortunately Peak Oil would not come soon enough to stop us having catastrophic problems. He mentioned that Jevons (him of the Paradox) was in Australia before writing his “The Coal Question”. [You learn something new every day, eh.] Garnaut said he reckoned in Peak Oil, gas would become a transitional fuel. RG neatly sidestepped it. “Debate won’t end with legislation passing. The legislation will only stay if public opinion is really behind it, so that removing the law would be very politically damaging.” He again cited the importance of an “independent centre” free of vested interests. The final question was on imposing Carbon-based import duties in the next three years. Garnaut had fun with this. He said “IF the rest of the world was doing little and we were doing lots, maybe, but the reality is reversed. He cited the European Union’s threat of taxing Qantas because of the lack of climate action here in Australia. There was prolonged applause at the end of the event which made me very uncomfortable. My initial and uncharitable interpretation was that people were as much applauding themselves for turning up and being Informed and Concerned Citizens as they were Prof Garnaut. And I was enraged that a plan that offers nothing other than the certainty of a 4 degree warmer world [that’s a catastrophe, btw] was being applauded rather than shredded. On reflection though, I wonder if that applause wasn’t mostly directed at Ross Garnaut himself. He is, as one of the questioners pointed out, by far the most visible and effective advocate of economic action on climate change in this country. 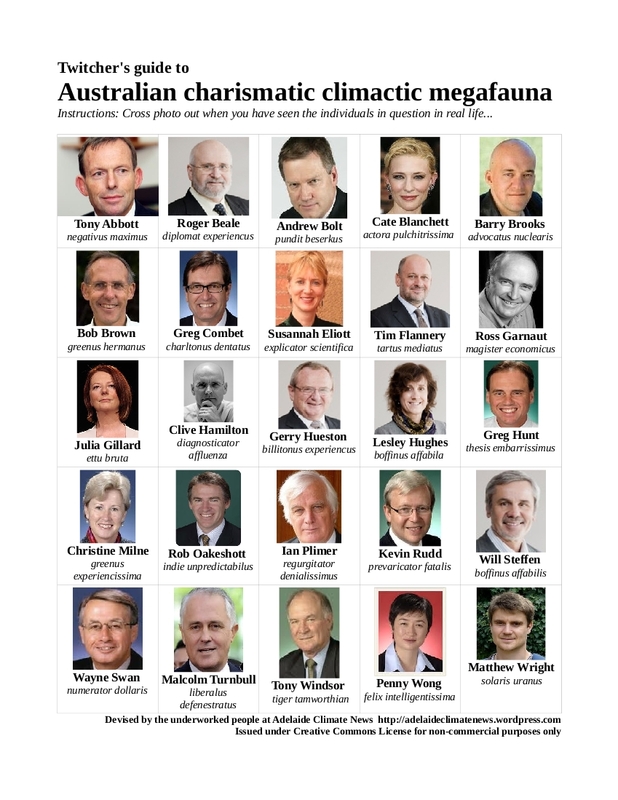 Where’s Gillard? Where’s Combet? Ferguson? Wong (to be fair, no longer her portfolio). Garnaut is a relatively uncharismatic technocrat, in his public pronouncements at least (and that’s not a criticism of him – he is doing what he has been asked to do, and within the logic of his Terms of Reference, he’s doing an admirably diligent job). It’s not for him to carry all this weight. The political classes should be getting off their arses. Professor Ross Garnaut’s first public appearance after the release of his final Climate Report sparked a near riot at the Adelaide Convention Centre earlier this evening. The economist and climate expert’s presentation was received with muted applause, and he was unexpectedly harangued for the insufficient vigour of his recommendations to the Gillard Government. The lecture theatre then emptied rapidly as the audience marched on the State Parliament for an impromptu democratic forum. A visibly shocked Professor Garnaut told the questioner that his views were almost certainly in an extreme minority. Before he could continue, a member of the audience stood up and shouted “Oh yeah? Let’s see! Who thinks we have to do more?” At this, more than two thirds of the audience stood and unfurled banners proclaiming “Nurses for healing the planet” “Retail workers for climate sanity” “Insurers for a safe planet” and the like. Prolonged hand-clapping then forced Professor Garnaut to take his seat. A cry rose up, echoed around the auditorium – “To the Parliament Building!” Within two minutes the room was empty, and a peaceful procession wended its way up North Terrace. The crowd on the steps of Parliament House was exuberant, with people swapping contact details and making plans. At one point a small group of young people seemed intent on proving their radical credibility by smashing windows. They were quickly surrounded by a group of older women, told that true radicalism meant commitment and intelligence, and that they should disperse peacefully. One of the women told this reporter that she recognized one of the young men involved inciting others as a police officer, and raised the spectre of agents provocateur. In its new-found commitment to the right to protest, the Advertiser will ask the State Police to confirm or deny the presence of plainclothes or undercover officers. The Advertiser reporter’s note-taking of the event was witnessed by several in the crowd, and given the Murdoch press’s commitment to spreading misinformation and fear about climate change, it’s unsurprising that the hashtag #Tisertosh trended locally on Twitter. * The Advertiser should be encouraged in all non-violent means to appoint a panel of climate scientists to give same-day rebuttals to the climate denialism letters that the letters editor seems intent on publishing. The panel should be made up almost entirely of scientists with a peer-reviewed publication background, with views on the reality of human-induced climate change in proportion to the international consensus. This would entitle Ian Plimer and his ilk to 7 days a year to wave through appalling mis-representations of the established facts. Before peacefully dispersing at 9pm, people were twice encouraged to “mingle with intent” – firstly on the basis of where they lived, and secondly on the basis of their jobs – students, teachers, retail workers, advertising executives, health care professionals. They were encouraged to swap contact details, and to start planning local action aimed at making their City Councils and employers more responsible.